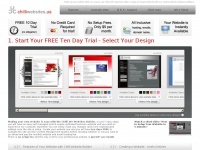 Make my own website with our easy to use online DIY website builder create an instant website with our simple web designer software. The web server used by Chilliwebsites.us is located in Brisbane, Australia and is run by Hosting Shop. On this web server 13 other websites are hosted. The language of those websites is mostly english. The Chilliwebsites.us websites were developed using the programming language ASP.NET and served by a Microsoft-IIS server. HTML 4.01 Transitional is used as markup language on the webpages. To analyze the visitors, the websites uses the analysis software Google Analytics. Indexing the data of the website and following hyperlinks on it is explicitly allowed by robot information.